This entry was posted on Tuesday, November 6th, 2018 at 11:23 am. CONCERN continues for residents of Westbury as photomontage images of the proposed ATT waste plant show ‘a construction that dominates the town and surrounding landscape’. Photomontage images, direct from the online planning application from Hill’s Waste Solutions (Northacre Renewable Energy), show how the proposed development would look from a number of locations around the town, created by the company’s own agents ‘Design With Nature’. Members of the Westbury Gasification Action Group (WGAG) have expressed their concerns that the plant – which has been compared to exceeding the height of the Titanic, will be blocking the landscape. 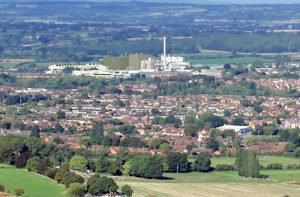 As the deadline of the public consultation approaches, with comments due by Friday 16th November, members of WGAG are encouraging all residents to make their comments either online via the Wiltshire Council planning portal using the number 18/09473/WCM or by writing to Andrew Guest, Development Services, Wiltshire Council, BA14 8JN. Dan Gmaj, from WGAG said, “The Proposed ATT (advanced thermal treatment) waste plant for Westbury continues to cause concern as photomontage pictures from the application itself clearly show a construction that dominates the town and surrounding landscape. “When the public consultation closes, the burden of decision moves to the strategic planning committee. I hope that the voting members at County Hall will see that, with a building height 4 metres higher than the Titanic and the chimney reaching a massive 22 metres above that, that it is quite simply, an inappropriate use of land in terms of size and density of buildings proposed. “NRE/Hills have not, as they have claimed, sufficiently addressed the concerns that led to the last refusal. Indeed the new application shows that both buildings and chimney are higher, and that much additional structure is now proposed to the 2015 proposal. “In short, this is an ‘Industrial Cathedral of Waste’ utilising untested and potentially dangerous technology that our MP Dr Andrew Murrison has already opposed citing the ‘Precautionary Principle’. “I hope that the fear of any appeal costs to Wiltshire Council will allay with public support growing to stop this inappropriate private structure and that members will vote to refuse permission for the new proposal, as they correctly did for the last ione n July of this year. For gods sake this is an outrageous repulsive sight..
Much to big & tall for this dear old town.. how can anyone think thats its ok to allow this megga massive vile plant to be developed at our beautiful land… (whats left of it) what have we got left in this town… Nothing, nothing at all its all gone .. lakes, lovely walks, wildlife, views …why, who is allowing this to happen? Having just read this article and the DEFRA report; Advanced Thermal Treatment of Solid Municipal Waste MSW), I am concerned that MP Dr Andrew Murrison’s assertion that this is a potentially dangerous and untested technology. However, on the basis of the proposed look of the development I agree that it does not appear to have been well conceived. The DEFRA report does cite that consideration must be given to the impact on the infrastructure, in this case I believe it is road transport of MSW to the site and removal of residual waste or end products that are a concern. I have not yet read the detailed planning application and will do so before making further comment. All I can say is that if this is given the go ahead, we will move out of Westbury for concerns over the health and well-being of my family. The smell from Hills is already awful when the wind sends the fumes towards town, so i can already imagine how much worse it would be with the sote increasing. I’m sure I’m not the only mum and wife putting my family’s health first. Does Westbury council really want to risk losing family’s who want to stay and invest in our town to get it thriving?! We go to all the events the town put on since moving here 8years ago. But we WILL leave if this is allowed to happy. It will distroy the “country” town and create a town that services the plant. If this goes through it will be a very sad day for westbury and surrounding areas, the traffic and the pollution that it will bring will affect lives, not to mention the pollution from the chimney, my children and grandchildren live here and I worried about the future health! We have had a brief restbite from the cementworks chimney and now this!!! Why here?? Leave westbury along, let it thrive! Regardless of the details of this particular endeavor – with regard to the more generic and wide ranging issue the country has regarding waste management, what would the people of Westbury propose? Just “not here” I suspect? Perhaps this is no longer good enough? To simply ship the waste we generate out of sight of Westbury means its not Westbury’s problem I suppose but it doesn’t mean its not a problem.